Get Access To Over 130 WHOLESALE Pet Supply Distributors. Make additional profit by selling pet retail supplies! And too many more to list!! And thousands of more brands! Have you been pulling your hair out trying to find where you can purchase pet supplies at wholesale so that you can sell retail? 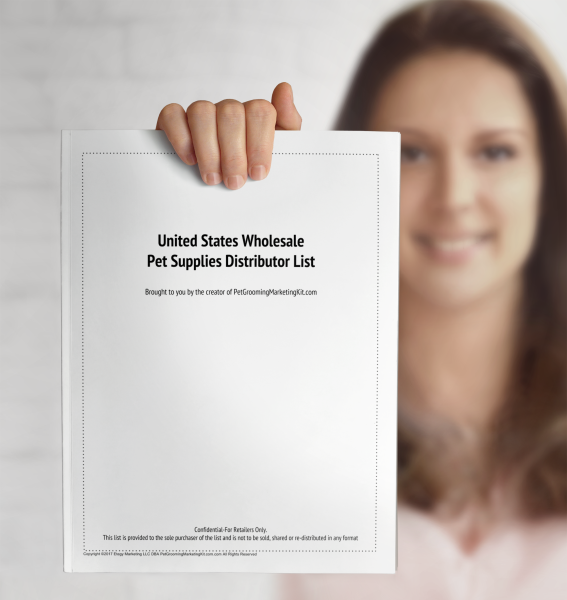 This list will give you access to over 130 U.S wholesale pet supply distributors. Enabling you to quickly find where to purchase wholesale pet supplies. Use the same distributors that Walmart, Petsmart, and other pet stores have access to. Finding legitimate wholesale distributors can be difficult. This list will give you all of the information that you have been searching for. The list contains the same distributors that big box stores like Walmart, Petco and others get their inventory from. Plus it includes wholesale distributors of specialty and boutique type merchandise. Get access to major pet foods, toys, pet clothing, supplements, grooming products and more. It's all here in a no-nonsense format. You can begin your retail dreams today! The list is included in all editions of The Groomer's Profit Kit. If you already have our kit, then you can find the list in the back of the marketing planner.